To be able to install modules and themes in Drupal straight from the browser without any FTP access and without downloading and configuring stuff, read on. This guide will explain how to achieve this on your own server, so admin Drupal user can install a module automatically in seconds without worrying about where to download and how to unpack and upload stuff. First of all, you need to be a root on the web server. This command will grant Apache2 privileges to access the /var/www folder and write to it, change /var/www to your Apache document root or only to the certain website, for example to /var/www/drupal7/www.mydomain.com. 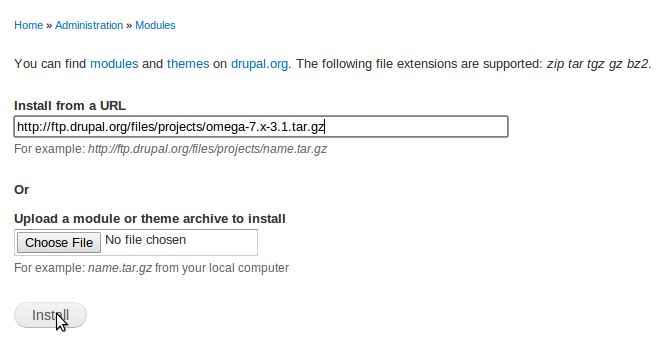 and paste a link, that you copy from your desired module on http://drupal.org/project/Modules. Theme is also considered as a module and may be installed in the same way.